Drowned Catacomb ($5.98) Price History from major stores - Ixalan - MTGPrice.com Values for Ebay, Amazon and hobby stores! 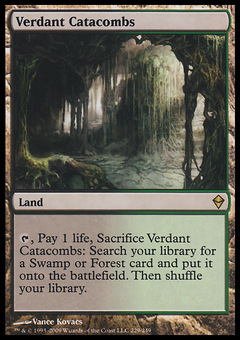 Card Text: Drowned Catacomb enters the battlefield tapped unless you control an Island or a Swamp. %T: Add %U or %B to your mana pool. Flavor Text: None can tell how many vessels are tangled up on the sea floor�or how much treasure remains unclaimed.